Sloppy, noisy, completely incoherent, this Enzo Castellari sequel to the equally ridiculous post-nuke original, 1999: The Bronx Warriors, features Mark Gregory as Trash, easily one of the most laughable action leads since Christopher Stone in The Annihilators. Here, we're rewarded with further coverage of the compelling drama plaguing New York City's the Bronx, as innocent parents, like Romano Puppo as Trash's daddy, are charbroiled with flame-throwers by Henry Silva and lots of men in aluminum suits. Didn't Castellari use enough tinfoil in The New Barbarians? Meanwhile, the local citizenry are being "relocated" by a big business tyrant and his evil armies, led by Silva. The end-battle/massacre is eternal, with the only highlights being numerous dummies violated and mangled in slow-motion, and Antonio Sabato's lumpy biceps. 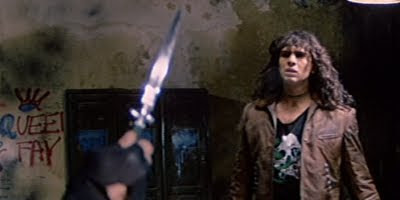 The horrible, lumbering music score makes the worst use of redundant electric guitar melodies, and it's doubtful even the brilliant Claudio Simonetti could do much to improve this mess. Mark Gregory oftentimes looks as lost as a frightened child during most of the movie's lackluster action sequences.